Hidden in a corner behind a construction, you’ll find Thoroughbred Food and Drink by their black circular sign with a horse emblazoned on it. Located directly across from the Scotiabank Theatre, it’s conveniently situated if you’re grabbing a bite before or after a movie. In fact, that’s what brought me and my friends to the restaurant. Thoroughbred’s cocktail menu is short but effective. I started with the Art Vandelay ($13), a fancier gin and tonic. 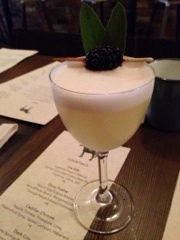 Made with Hayman’s London Dry gin and Dr. Van Nostrand’s tonic, there’s also the addition of sage leaves, lime juice, hop and grapefruit bitters and a smooth egg white to top it off. Refreshing and light it reminded me of the Most Unusual Drink I enjoyed at Bramble Bar in Edinburgh. Their dinner menu, on the bottom floor, is fairly limited with three sandwiches and about ten small plates. Given the sandwiches don’t arrive with sides, Thoroughbred’s menu should be expanded to add more items that better pairs with burgers. Sure, they offer a Waldorf grain salad and a squash & watermelon one, but if you’re not fond of the mayonnaise or fruit with your greens than the choices are limited. Really, I would have just wanted a simple kale or spring mix instead. 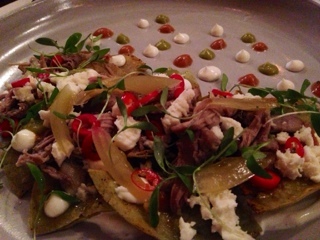 My friend and I decided to split the duck confit nachos ($9) as our side – the furthest thing from a healthy green. Admittedly, it was good with tender pieces of full flavoured duck confit, topped with pickled onions, bird’s eye chilies, micro greens and large pieces of queso fresco (a soft Mexican cheese). Dots of tomatillo sauce, salsa roja and sour cream surround the nachos and add visual appeal to the plate. The nachos were a great combination of flavours (savoury, salty and even a slightly sweet property from the pickled onions) and textures. Just don’t expect to be full after an order as there’s only about eight tortillas per plate. The B.L.T. ($12) was another flavourful dish that I loved. The slices of pork jowl car siu (roasted pork) definitely stole the show adding sweet and sticky elements to the sandwich. 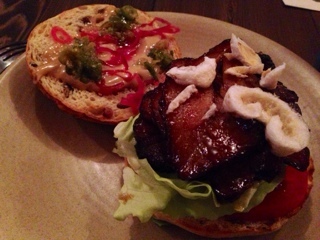 The bacon was incorporated into the soft challah bread so you get the faint aroma of it as you bite through the bun. Some delicious sauces (relish and a tomato aioli? ), pickled onions and a few chicharron (pork rinds) rounds it all off. The B.L.T. was absolutely delicious and worth trying. My friend’s burger ($12) seemed a little “lighter”. 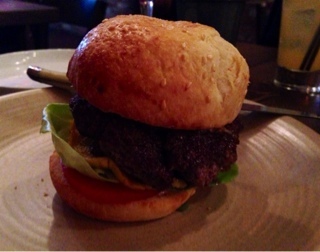 But, it’s still substantial with a beef patty that’s almost the same size as the brioche bun. Little did I realize that this new restaurant has a dining room on the second floor that offers more substantial fare. Given the delightful experience I had with their “casual” creations, I can’t wait for the opportunity to return and try the chef’s menu.